Que belos dias! / What wonderful days! Foi uma semana em cheio! 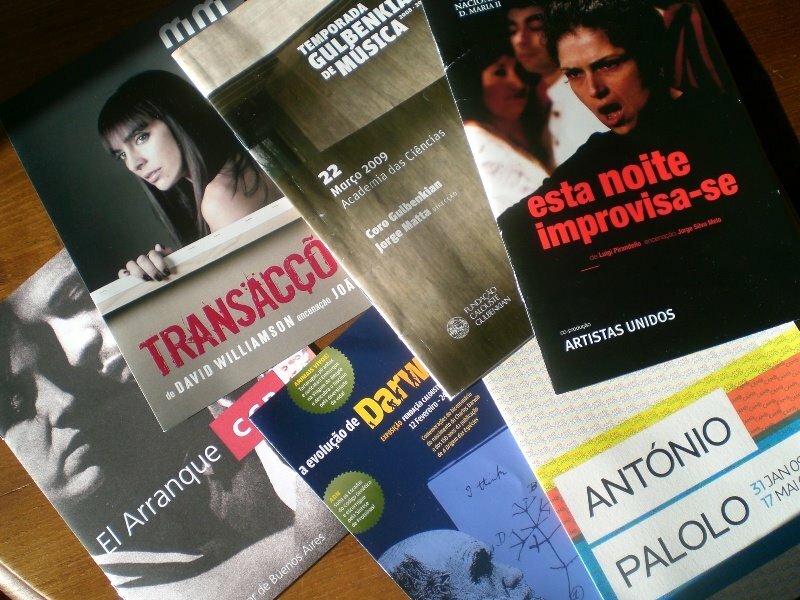 Espectáculo de tango, teatro, música, exposições! Conhecer a nova sobrinha neta (já são 16!!! – netas incluídas), rever toda a família lisboeta no aniversário do sobrinho mais velho! It was a great week! Tango show, theatre, music, exhibitions! To know in person the new grand-niece (already 16 grand-children!!! – grand-daughters included), to meet again all the family from Lisbon at the eldest nephew birthday! e ainda deu para ir comprar esta caixinha para as canelas, uma vez que não ganhei o sorteio da Ana ! 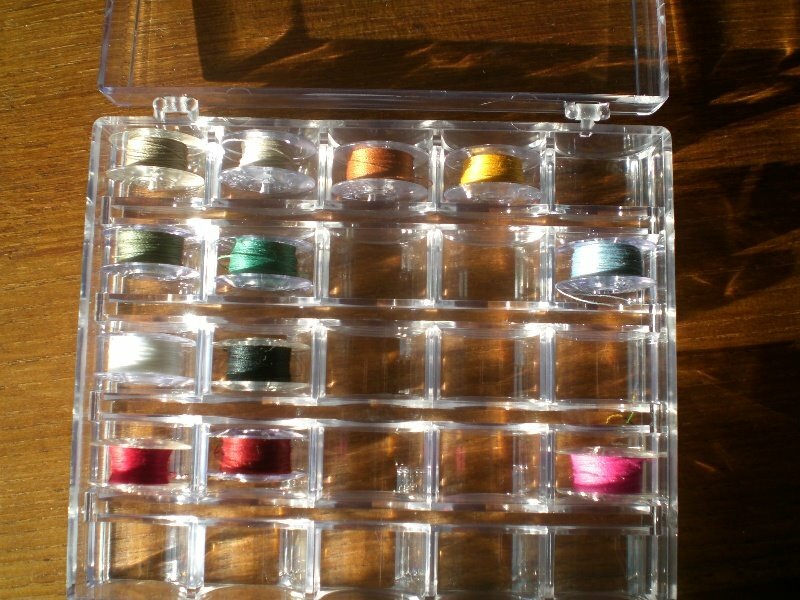 and still gave time for buying this little bobbin box, once I haven’t win Ana‘s giveaway! e consegui ir conhecer a loja nova da Luísa, cheiinha de tecidos e revistas, lindissimos! E tudo para patchwork e quilts. Já repararam naquele tecido com os gatos? Não tirei fotografias na loja, mas vão lá ao blog, vão! A Luísa também organiza workshops. Gostei, gostei mesmo de a conhecer e mais uma vez lhe quero desejar toda a sorte para este desafio, porque também é preciso alguma. Competência e profissionalismo já há. and I’ve managed to visit Luísa new shop, full of wonderful magazines and fabrics! And everything to do patchwork and quilts. Have you already seen that fabric with cats? I haven’t any photo at the shop, but visit her blog, please! Luísa organizes workshops too. I liked very much to know you Luisa and once more I whish you luck. There is already capacity and qualification. Uma pequena bolsa está feita (tutorial aqui). É pequena mas para a foto meti lá : bâton, verniz, base, blush, sombra e lápis de olhos, eye-liner, máscara – e sobra espaço para lima e tesoura de unhas, pinça e mais qualquer coisinha. e, parecendo impossível, foi o primeiro fecho de correr que cosi e não ficou mal, digo eu. A little pouch is done (tutorial here). It’s little but for the photo I put in: lipstick, make-up, nail varnish, blush, pencil and eyeshadow, eye-liner, rimel – and still has left place for nail-file and nail scissors, tweezers and anything more. and even if it seems strange it was the first zipper I had sewn in my long life and it’s fine, I think. This entry was posted in coisas / things, comércio local / local shops, costura / sewing and tagged bags and purses by meri. Bookmark the permalink. Love your cat pouch – such a handy travel size! Glad you enjoyed yoru trip Meri. Happy to hear that you had a wonderful trip, Meri. 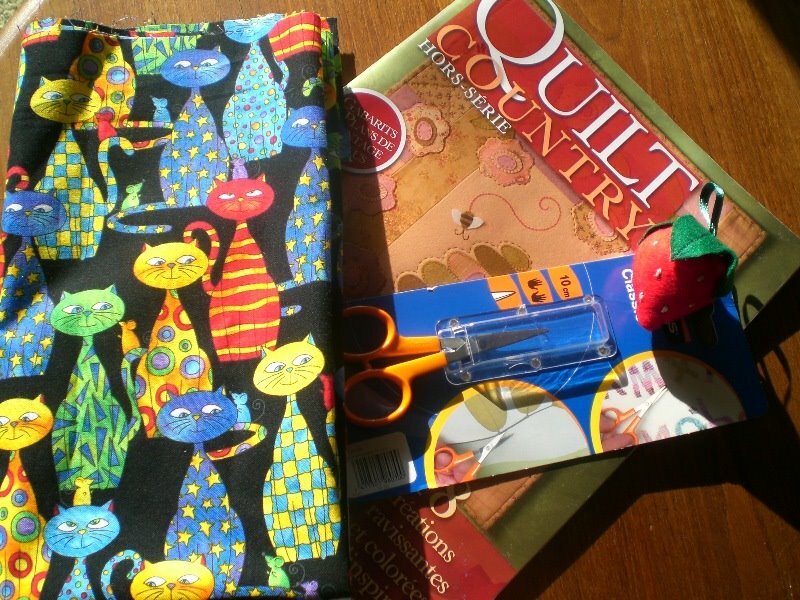 I love the pouch you made from that cute cat fabric. 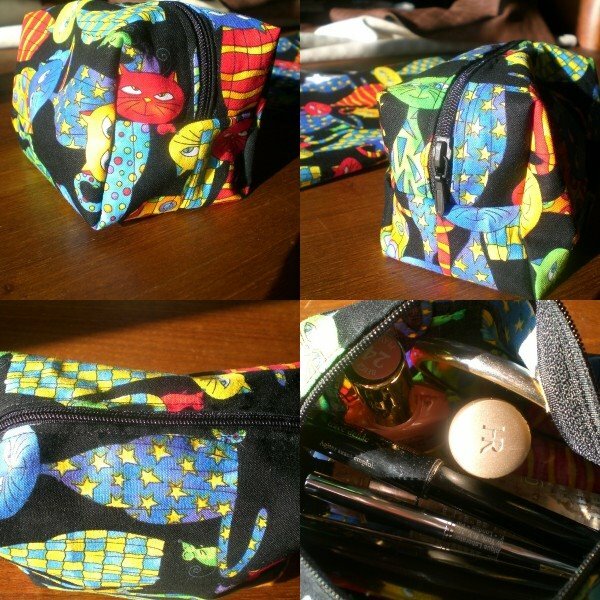 Looks like the perfect bag for keeping small items organized and handy.